This was a piece I worked on a long long time ago. My mom wanted a seascape with a sea turtle, but working at this large size is a struggle for me. I have another commission now, that is the exact same size, and I am having the same struggle. The turtle is finally finished now, I just need to take some good photos of it before posting. I am in love with the finished product, so I want to make sure the photo does it justice. This piece was done completely in oil paint and the long dry times helped me greatly when working on the background. However, it does add time to the entire process. On another note, getting good images of art is pretty difficult when they are too large to scan. I have seen WIP Wednesday done before on other sites and decided to follow suit. So I plan on showing some of my works in progress going forward. 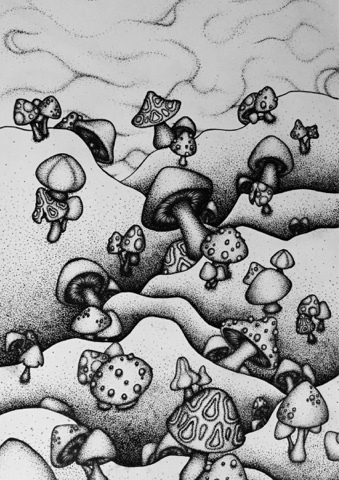 I have been working on a pointillism piece for over a week now and to most people it may look finished, but I have some more plans for it. I do find the process of dotting the whole page to be fairly therapeutic, but it takes forever. I don't recommend pointillism if you want to finish a peice quickly. The other fun note about this work, is that I plan on making a version of this available for my coloring book. I hope you guys like it and look forward to seeing more works in progress in the future. I hope everyone had a wonderful start to the New Year and has a great year! Well this year I am changing my goal to try to make it more positive. I know I have a lot of goals already that have to do with art, but my New Years resolution generally doesn't coincide with these. Work hard on completing pieces in a more timely manner. Spend more time working on things that I enjoy, because any art work will help me improve rather than doing none. All pretty vague, which is perfect. By being less specific about what you want to do, you are much less likely to get discouraged for making mistakes, or having things come up which interfere for some amount of time. I am posting these goals in my office/studio to make sure I can see them, and remind myself what I want to be working on when I am feeling less than motivated. What are everyone's goals out there? Do your new year's resolutions align with your life goals? For the first post in Forever! 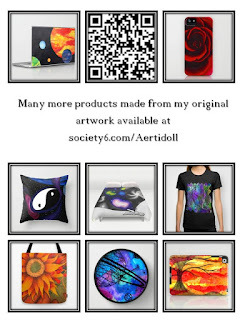 Right now there is a sale on Society6! One of the best deals of the season, 20% off your whole order and free shipping. There are a ton of products available! There is a winery close to where I live that I visit. Just this past week, I began showing my art there for three months! Port of Leonardtown Winery in St. Mary's County Maryland is a co-op winery with all of their grapes and provided products being made in Maryland! 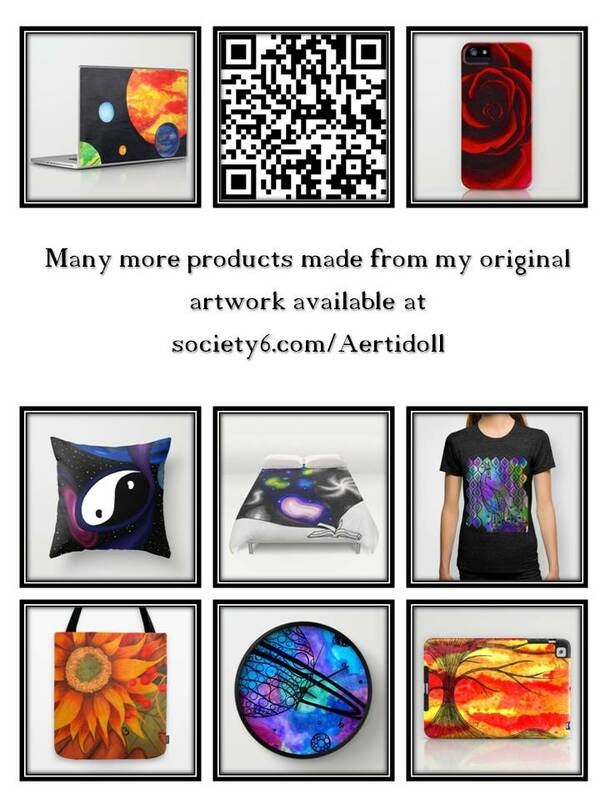 As a fan as well as local artist, I am very happy to be showing here! My husband took this photo of me hanging pieces, but you can also see my works on the wall behind me. Let me know if you stop by and what you think of the wine! My favorite is their Vidalacato, followed by the Breton Bay Shoals, both of which are sweet. I'm sure many of you have seen the posts on YouTube about water marbling using nail polish to make your nails pretty. There's also a way to do this for canvases or basically any material you would like to have water marbled. Below I have pictures of two different ways to water marble on two different surfaces. 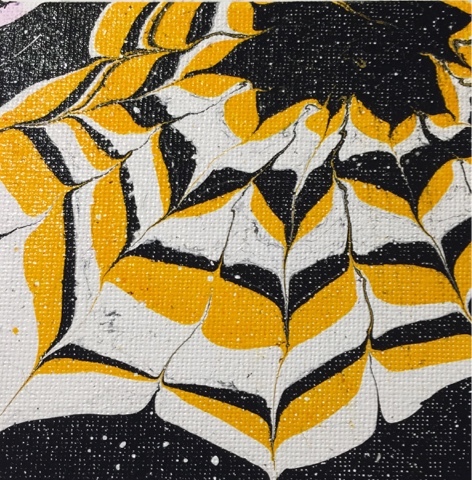 The first image here uses Marubu easy marble and is done on a 4 x 4 canvas board. This type of marbling paint is oil based and therefore takes a little while to dry depending on the surface. The second example is done on card stock using alcohol inks that were dripped on top of the water's surface. As you can see the effects very greatly based on these two types of marbling techniques. The oil-based paint allows for more manipulation once it is on the water, while the alcohol ink dries very quickly once on the card-stock. The drawback of the oil-based paint is the dry time, and the only type of paint you can use on top of it is more oil paint. 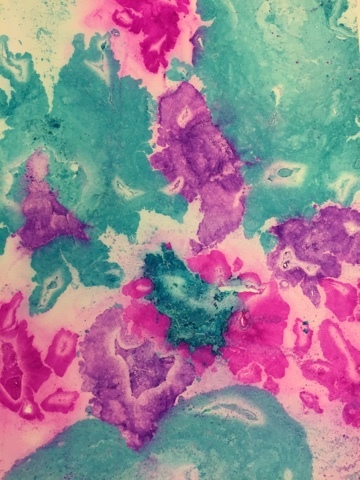 The alcohol ink allows for the creation of very loose deigns and can be painted on top of with most other media afterwards. Alcohol, however will mix with the water if manipulated too much, and therefore, can't be used to create intricate designs. I have decided to make a coloring book using some of my incomplete Zen inspired art. 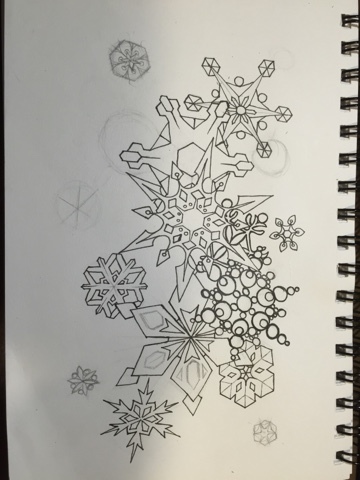 This one is an unfinished snowflake design. I also have a design using planets, a design using stars, and one using an underwater theme. There will definitely be more to come, but at the moment I'm not sure what all the subject matter will be. My plan is to have it completed by the first craft show we have, that way I may be able to sell copies there. What do you think a good length for a coloring book is, in pages? Any designs you would like to see?